I came upon a story called The Sistine Madonna, by Vasily Grossman, a writer and survivor of Soviet and Nazi antisemitism. A black and white picture of the painting Sistine Madonna was included in the story, so my curiosity was piqued. I found a good quality color reproduction of this painting and I wish to share with you my thoughts. The Sistine Madonna is a painting by the great Renaissance artist, Raphael. It shows Mary in full standing form holding the Christ child who is looking straight at us. 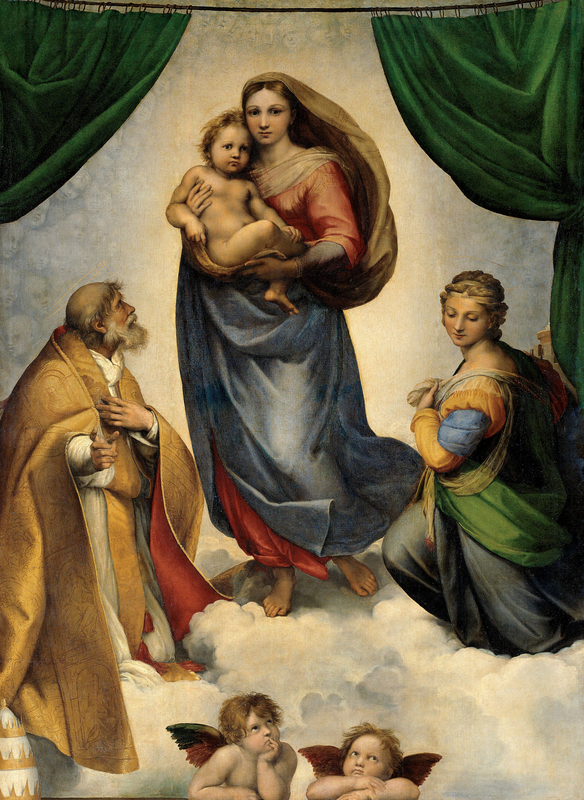 It is called the Sistine Madonna not because it was in the Sistine Chapel, but rather it was commissioned in 1512 by Pope Julius II for the church of San Sisto. It is an incredibly human painting of the young Mary, her face glowing with motherly love. As a matter of fact I would say that this painting shows Mary as a human mother more than any icon I have ever seen. Our icons tend to emphasize the transcendent rather than the earthly. I like talking about Mary, the mother of Christ. Yes, she is Theotokos, the Mother of God, and all those other amazing titles the church has bestowed upon her. But I like to think of her simply as Mary, Miriam, the young Jewish girl who was chosen by God for a most amazing miracle. In three days the Orthodox Church celebrates her entrance into the Temple in Jerusalem. The sheer irony never ceases to amaze me. The church celebrates the entrance into the holy of holies by a girl – something strictly forbidden by Jewish laws – and yet after 2,000 years the church still does not allow women or girls to serve in the altar in any way! As I said, irony. I was so overcome by the beauty of this painting that I took the upper portion of it and made it the wallpaper of my computer. So when I turn on my computer I immediately see the two faces touching each other and looking out toward me, toward all human beings. Mary looks a bit to her left while Christ looks straight at me. It is with my humanity, with your humanity, that Christ looks out. Looking at Christ I see my humanity in all its glory and all its sorrows and deficiencies. It’s all there. And Mary holds the Christ tenderly but firmly, as if to protect him from what the world will unleash against him. And we know that Mary did precisely that. The Gospels tell us that she kept a close watch on him and even tried to pull him away from combative encounters with the religious leaders. The Mary that I see in this painting is the Mary who sang the Magnificat in Luke, chapter 1. Do you know it? She spoke these words when she was pregnant. We sing her words at every matins service. for he has regarded the low estate of his handmaiden. She considers herself a humble handmaiden – but she is also a rebel and rejoices in the downfall of the mighty. As she looks slightly to her left in this painting she is perhaps imagining those centuries in the future when the mighty of the earth will try to refute her prophetic words by enlisting her son to their ambitions. And she holds her child tight. She does not want to see him used and abused by 2,000 years of human greed and hatred. But she does not hold him so tight as to restrain him from facing his destiny – his destiny on Golgotha; but also his destiny as Savior and Judge. So the child looks straight at us and 2,000 years of human history, with a look of defiance and already a look of judgment. 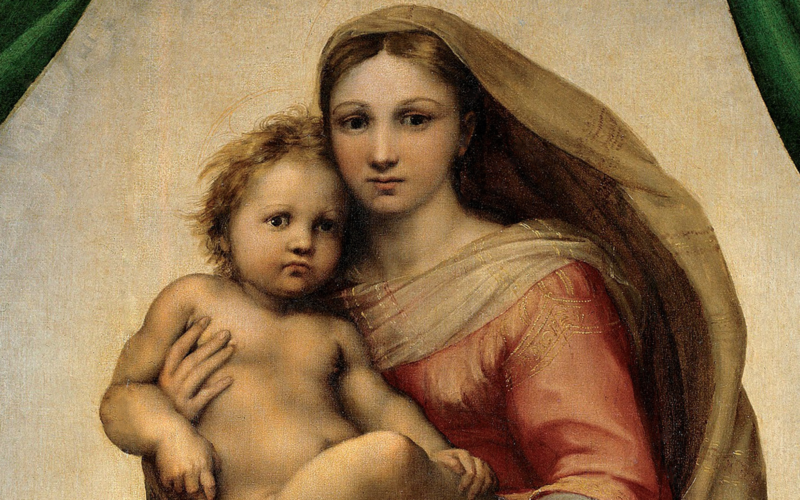 The face of the Christ child in this painting reminds me of the Star Child at the end of the film 2001: A Space Odyssey. Both images strike deep chords in me. Regardless the subtext that I’m reading into the Sistine Madonna, it remains a profoundly beautiful painting. It is profoundly humane, full of sorrowing compassion. It confronts us with questions: Do we see our humanity in Christ? Do we see the love of a mother and the love of a savior who is one of us? And do you see the unity that calls us forward in these times of profound danger? There is one body and one spirit, Paul tells us today in his letter to the Ephesians. We are called to unity, despite how much division and hatred keeps spreading in the world around us. Grossman lived through the decades of Nazi terror, world war, and Stalinist tyranny. As humanity was disappearing around him, he found humanity in this painting. Every one of us can be a beacon of humanity, Christ humanity! Only then do we prove to the world that Mary’s life was not in vain. That she who once held Christ in her arms is now held in his arms. It’s there, in his loving embrace that we find our true humanity. Categories: Sermons | Tags: Entrance of Mary in the Temple, Magnificat, Mary, Raphael, Star Child, Vasily Grossman | Permalink.